Everyone who listened to Xalapa-born Mauricio Rebolledo will agree that his inherent groove ‘will set your legs on fire’ as it’s right and proper for Jalapeños. He started DJing in 2002 and soon felt a lack of records through which he can convey his unique message to the dance floor. 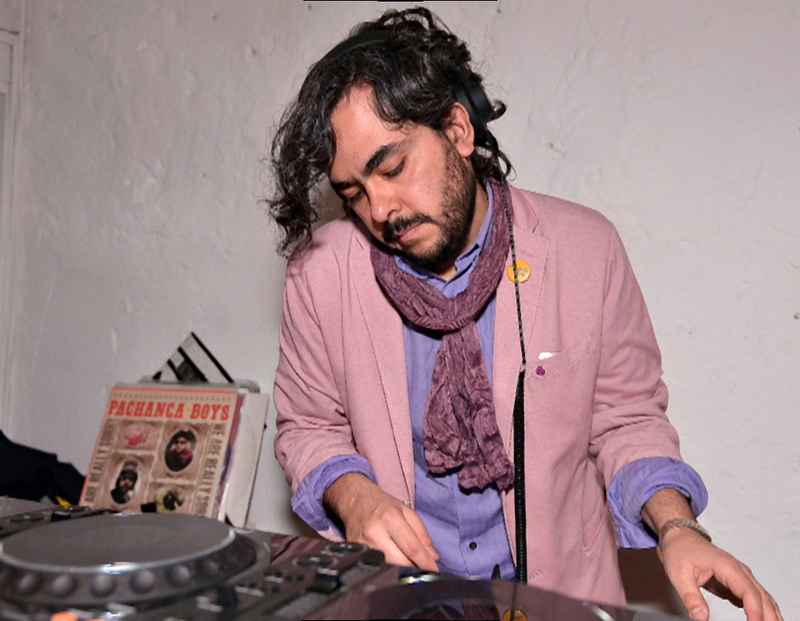 Others may surrender at a similar state of mind, but Rebolledo cut his way through in 2009 by firing the starting pistol for Cómeme’s label catalogue via ‘Pitaya Frenesí’ that also featured label founder Matias Aguayo. After some remix duties for labels as diverse as Tiga’s Turbo or John Talabot’s Hivern Discs, Rebolledo returned to the stage with his debut album Super Vato in 2011. In the same year, he and Superpitcher won ultimately the dance community’s heart with Pachanga Boys’ ‘Time’ and his recent mix CD Momento Drive for Kompakt emphasis once again that Rebolledo is your ideal pilot for your musical journey. Enjoy our chat about inspirations, the relationship between time and music and why it’s important to put as much love as possible in a label’s catalogue. Hi Mauricio! Can you select three influential records from your youth in Xalapa/Mexico and what do you associate with them? The three of them were usually being played at my father´s car so they were the soundtrack of many road trips and even if they can be a bit cheesy, they have a lot of power and sense of motion which I always liked in music. I still feel them and I always thought that they fit perfectly to the road. Do you see common points of David Mancuso, Giorgio Moroder, Wally Gonzales and Daniele Baldelli? First and foremost, I like them all. They are quite unique and great in their own fields but besides that, I don´t really see an obvious connection between them. The closest ones would be Baldelli and Mancuso I guess, both being great DJs with a wide spectrum of taste in music. Your music has a strong psychedelic influence. Have you ever heard Turkish psychedelic rock from the late ‘60s or ‘70s? I´m not really familiar with it but I would love to listen to it. Must be great! You started to produce music because you were feeling a lack of relevant records to create special moments. Do you think that creating these moments is easier at clubs compared to festivals? It´s different, I would not call it easier. I think that you can be more extreme in a club and go to very different places with the music which is also facilitated by the fact that you usually have more time to built this. In contrary, festivals are a bit more straight forward and you have to be somehow more effective in shorter time. Your 2011 worldwide hit ‘Time’ is a 15 minutes epic journey and you and Superpitcher played last year a 25 hours set in Mexico called ‘Lost Track Of Time’. Do you think that music as a medium enables people to uncouple from time limitations? Totally! Music can take you to places and loose yourself in incredible ways eventually changing your perspective and by-passing time. What characteristics should a last track of a club night own? Exactly the above. It has to make you feel that you´re having some kind of night adventure. You remix of Matias Aguayo’s ‘Rollerskate’ and your debut releases on Cómeme attracted international attention for your productions in 2009. Where and when did the friendship and the idea to collaborate with Matias Aguayo evolve? We met in Mexico back in the mid ’00s, where I also met Michael Mayer, Tobias Thomas and Aksel (Superpitcher). We became friends right away and he kept on coming back as a guest to ‘La Santanera’ in Playa del Carmen where I used to be a resident. The friendship evolved and at the same time I was telling him that DJing was not enough anymore for me and I wanted to start producing my own music so he told me that he had this idea of a new label which resulted in the birth of ‘Cómeme’. You released in the beginning of the year your new mix CD ‘Momento Drive’ via Kompakt. Do you think that physical compilation will become obsolete in times of stream services? I would never call it obsolete because I´m an absolute object lover and collector. So for me, having something that I can actually touch and go through is a big plus. However, it’s evident that there is less demand for mix CD than it used be. Against this background, you must make sure to compile something really special. Hence, I´m so happy and honoured that Kompakt trusted me for this challenging task. We had recently an interview with Erol Alkan at which he mentioned that ‘It’s not right that people were paying £100 for a copy of my Connan Mockasin remix on Discogs. People should have access to it if they want it, and for the right price.’ Your label Hippie Dance achieved a cult status and the limited Girlcatcher EP in particular is trading for at least 350EUR nowadays. Do you think this is fine as long as people have access to it in digital format? Actually, I don´t mind. The original price was less than 12EUR so the ones who liked it since day one and went for it deserve it now and that´s exactly the concept of a limited edition. People can have access to the music digitally and that´s great as well. However, we put so much effort on each release doing a special concept, packaging and design, that it really does not bother me if its price goes so high. Before the end of the year, we will be releasing a very special record on Hippie Dance from a mysterious individual. Can´t tell too much about it because we don´t know so much about it actually. I just can tell you that we loved what he showed us and we´re super happy to release it. Next year is going to be a busy one. I’m working on new solo material that I’m looking forward to release.